I made time for stovetop oats this morning. I didn't time myself today, but I did manage to pick out an outfit for the day while my milk came to a boil. Stovetop oats may be slow, but at least you can kind of multi-task while you make them. My bowl contained organic pumpkin and organic coconut. I basically made my oats like in this recipe but added coconut whilst cooking and as a topping. A little protein to keep me fuller longer - Morningstar organic soysage. I was supposed to be in AZ this week for work, but the meetings ended up being more for my core team than me. This meant a lighter day of conference calls for me! Hooray! I needed a light day (light on phone conferences, that is). I've been craving Velveeta Shells & Cheese lately for some random reason so I decided to feed the craving tonight. I got the 2% milk kind, but I'm thinking I like the original best. I'm sure this stuff is terrible for you and I can't think of any nutritional value it adds, but it sure tastes good. Everything in moderation. I sauted some all natural chicken I got from Earthfare with some of this Richard's Delicious Seasoning in olive oil. I also made steamed broccoli, which I think is perfect topped with a drizzle of melted organic butter. The mac and cheese wasn't quite as good as I remembered it to be. Think I'm gonna have to go "original" next time. Some things are just better non-"healthified"
A little extra mac and cheese. *SYTYCD SPOILER* We sat down to dinner just as SYTYCD was ending. I can't believe they sent Mollee home! Waahh...she was my fave! 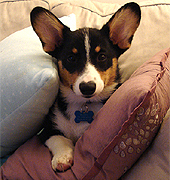 I also really like Russel, though...I'm hoping he stays for a bit. As I was taking my first bite of food, Glee came on! I love when one of my fave shows is on as I'm sitting down to dinner. I'm typically such a multi-tasker/workaholic, when I'm eating it's one of the few times you can catch me sitting still. Lookie what I got! I found the pine cones I was itching to buy after seeing them at Kate + Nate's house. My house reeks of polyurethane still (I can't believe it! ), so I'm hoping these cinnamon-scented pine cones keep us distracted till the stinky smell goes away. So far so good! Lookie what else I got - an oats upgrade by way of Bob's Red Mill Extra Thick Rolled Oats. I've had oats envy ever since helping my friend start up his own oatmeal kit this past March (click for post). He wanted to start eating oatmeal for breakfast so I suggested he go for one of the better oats - extra thick. Oh yes! I'm sort of weird about about food and money. Sometimes I can talk myself into buying the more expensive version of something and sometimes I'm really good at talking myself out of buying it. I've been able to talk myself out off the more expensive oats for nearly a year, but no more! After running out of oats yesterday and seeing this bag staring at me at Earthfare tonight (and no small sizes of Quaker available and the kind I buy at Trader Joe's priced way higher), I decided to go for it! I can't wait to try these out...hopefully tomorrow morning depending on if I sleep in or snooze much...haha. What's your favorite type of grain to eat for breakfast? If oatmeal, what kind? I made a delicious concoction of oats this morning - Butterscotch Pumpkin Oats. Sipping coffee whilst cooking stove top oats. Organic "soysage" - some savory to balance the sweetness of the oats. Top with chopped butterscotch chips and pecans. Enjoy! I got back from CPR/AED/First Aid Certification around 2pm and planned to head over to a friend's house later for a holiday movie marathon around 3:15pm. Unfortunately, we were out of butter, so a grocery store trip was a must. Knowing I was short on time, I at least had the foresight to pick up some Chocolate Chip Cookie mix from Great Harvest, while I was there picking up bread for the week. I figured using a mix would help me make some cookies quickly. Hey, cookies don't have to be made from scratch to be good, and with great ingredients like the ones in this mix, they're pretty close! I read the ingredient list and it looked pretty darn clean. I was attracted to the package because of the price ($4.95) and the whole grain goodness! I also picked up some more Trader Joe's Organic Butter. So very good. I almost picked up some Earth Balance while I was at Trader Joe's, but I'm very skeptical of margarine-type products. I read the ingredient list and it seemed decent, but does any one know for sure one way or the other? It was 2:45 by the time I got back from the grocery store. Luckily, hubby helped me out by lining the baking sheets with parchment paper while I got the oven pre-heating and the cookies mixed up. Guess this is what happens when you rush through baking - it's a uni-cookie! After letting the cookies cool on the baking sheets for about 5 minutes, I quickly transferred the cookie-covered-parchment paper to wire racks to attempt faster cooling. By the time the cookies were cooling, we were already running past our anticipated arrival time of 3:15pm, so I was starting to feel anxious about getting on the road. After letting the cookies cool some more, I finally loaded them up, slightly warm and all. I used parchment paper I baked with to do the lining between layers of cookies. Hey, I know I like still-warm-from-the-oven-cookies, so other people must, too, right? Right! I dunno, I was too busy rushing to get going that I didn't get to taste test. Cookies ready, we set off for our holiday movie marathon. Time to spread more holiday cheer for my Christmas Cookie Challenge! Tally-ho! With my company's Food Day happening on Friday, I knew I had to cook something (no matter how tired) Thursday night. What better to make than cookies for my Holiday Cookie Challenge?! I didn't know what to make, so I just went to the grocery store and picked up semi-sweet chocolate chips and butterscotch chips and figured I'd surely be able to bake something with them. After some browsing on the web, I settled on making Oatmeal Butterscotch Cookies (click for recipe) . I made a halved the recipe and used organic butter. The cookies mixed up quite nicely. After reading some reviews, I decided to bake my cookies at 350 degrees F for 9 minutes. I got quite the variance in my cookie doneness - must have been the different pans! Look how much darker the cookies are on the right! The cookies smelled amazing! I had forgotten how yummy butterscotch smells and tastes! Perfect with some skim milk! Oh yea! I had to taste test a couple...you know...to make sure they were ok to give out to my co-workers and friends. They were faboo - nice and chewy! I may play with the recipe a bit...I think it could possibly use some more flour or something, but the flavor was quite nice. I used the parchment paper I baked with to line a large tupperware and keep my layers of cookies separated. Ahhh...all ready to go for Food Day! I was later posting my blog about my Holiday Cookie Challenge than I expected, so my timing is poor. Buuut, I actually baked my first batch of cookies for the Holiday Cookie Challenge this past weekend. I baked up Martha Stewart's Chewy Chocolate Gingerbread Cookies. Boy, did these babies make my whole house smell like Christmas or what?! I love chewy cookies. I love gingerbread cookies. I love chocolate chip cookies. Therefore, I love chewy chocolate gingerbread cookies. Yummers! What's a girl to do but take some of the yummy cookies to sushi night with my fave zumba girls!? I had intentions to give more of these away, but my plans didn't work out. I'm hoping to make up for my missed cheer-spreading with my next batch! What kinds of holiday cookies are you baking?! 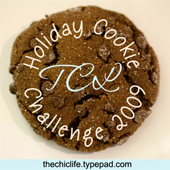 Are you in for the Holiday Cookie Challenge? I made a super yummy dinner last night - Spiced Shrimp Quinoa! So faboo...even hubby loved it! Note pretty yellow color. I added this with spices! I added cumin and chili powder for flavor...I added turmeric for nutritional benefits, color, and of course, flavor. 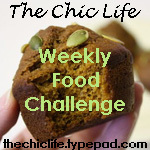 You can read about my previous turmeric challenge with tidbits by clicking here. Healthy Ashley's Bake Sale for a Good Cause! Healthy Ashley is having a Vegan and Gluten-Free bake sale fundraiser for Team in Training to benefit the Leukemia and Lymphoma Society! - All baked goods will be vegan and some will be gluten-free. - Bids can be emailed to healthyashley@gmail.com early for those who can't make it to a computer during that time frame. 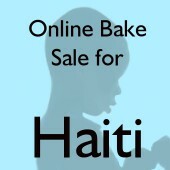 - Highest bids will be updated frequently on main bake sale page. - The funds from winning bids must be posted to my TnT fundraising page (http://pages.teamintraining.org/cfl/dipihalf10/asickles) within 24 hours of winning confirmation email or next bidder automatically wins. - Winning bidders can expect to have their product shipped out within three (3) days of the bake sale as long as shipping address is received promptly. Ahh...December is here and with this time of year, we find ourselves amidst a sea of holiday madness: gift searching, shopping, cooking, traveling, card sending, and all that other fun stuff we do around the holidays. If you're like me, you also look forward to another holiday pastime: baking! When the holidays arrive, I love to experiment with new recipes so I can bake up a storm and give my friends and family sweet treats to spread the holiday cheer and let them know I'm thinking of them. This year, I've decided to challenge myself to try at least one new cookie recipe per weekend through Christmas. I thought this would be a fun way to make sure I don't procrastinate and actually do the baking I want to and will also give me the opportunity to try out some new recipes. Now, what happens when you bake? You create batches and batches of sweets that you (and your family/SOs/etc) don't need to be eating all by your lonesome. Sometimes you bake with the intention of giving all or a portion of your baked goods to someone. Sometimes, you bake for yourself and don't know what to do with all the sweets you've created (which sometimes, sadly, end up going bad if you can't finish them yourself). Well, this year, why not spread the holiday cheer by vowing to gift some of your sweet treats to someone deserving? Save all or a portion of one of your weekend batches to give to that co-worker who did you a favor, your family member who is always there for you, the nice clerk at the store who is always so helpful, your veterinarian who always takes such good care of your pets...the possibilities are ENDLESS! Who can play in the Holiday Cookie Challenge? Anyone! YOU can! How do you play in the Holiday Cookie Challenge? Bake a new cookie recipe every weekend through Christmas (or just one time this season). Gift all or some of your cookies to someone to spread the holiday cheer. Leave me a comment with what you baked and who you gave some (or all) of your cookies to (and why you chose the person you did if you'd like to share). Links to blog posts with the details and photos work too. And if you don't have a blog but want to share a photo, you can email that to me at thechiclife at gmail dot com. Photos of what you baked and/or who you gave them to (if they permit their photo being published of course) would be awesome! I've even created this nifty badge in case you'd like to use it on your blog template or posts. Then Heather Said takes the challenge to a new level with one cookie baked per day - you go girl! Who's In?! What's your favorite holiday cookie recipe? What's a recipe you'd like to try? After the suuuuper long Saturday I had yesterday, I definitely slept in again. By the time I woke up, I was needing coffee and something good to eat for breakfast. Hubby brewed this bag of Starbucks Africa Kitamu coffee he brought home from his trip to DC. For breakfast, I decided to do French Toast with a TWIST! I used some cage-free eggs to make my custard. I used some Great Harvest Honey Whole Wheat bread that we've had around for a few days. I sipped on coffee and browsed my new Crate and Barrel catalog whilst cooking up breakfast. Got a little crazy with the cinnamon. My secret ingredient - Trader Joe's Pumpkin Butter - this plus the cinnamon gave the French Toast a really great fall flavor. Since I still only have my tiny non-stick pans (hope to remedy this once we're in the house), I could only cook 2 pieces of French Toast at a time. I kept the cooked pieces warm in the oven on 250 degrees F.
Breakfast is served! With the Pumpkin-Spiced French Toast, I also had some more Canadian bacon and some maple syrup warmed up with some real butter. After brunch, I did some serious packing. We loaded up 1 1/2 cars worth of boxes and stuff and headed over to the house to check out our newly refinished hardwoods. We can't walk on them till Wednesday so until then...we wait. I think they look GREAT, though! After checking out the house, I headed over to my new favorite grocery store - Earthfare! I was hungry for a snack and lucked out by filling up on samples in the prepared food section. I really was picking out stuff to eat for the week, so I wasn't just eating their samples for nothing. Earthfare had their organic pumpkin on sale - 3 for $5! I normally try to get rid of stuff in my pantry when I'm getting ready to move, but I couldn't pass on this deal. I got 3 cans. I'll just have to move them...it will be worth it. We are also out of coffee. I didn't want to pick up a big bag only to turn around and have to move it, so I just filled a bag up with enough to get us through a couple days. I decided to try a fair trade coffee by Larry's Beans in Costa Little Ricky blend, which comes from Raleigh, NC. I wonder if they do tours? I'd love to check them out next time I'm visiting my MIL. I tried a new Odwalla flavor - Pink Poetry - Earthfare had $1 off coupons in the refrigerated section. Looks like it's got some good stuff in it. Hubby brought home some pizza from our fave local pizza place - I had some bruschetta, 1 slice of pepperoni and 1 slice of cheese with a wee bit of coke. I picked up a couple treats for hubby and myself: 1 peanut butter chocolate chip cookie (for him) and a whole wheat chocolate chip cookie (for me). Look at that close-up! Phew, this has been a whirlwind weekend, but a GREAT one! Guess I need to rest up for the big MOVE! G'night! I got these organic yellow onions at Earthfare for under $3 - yea, the whole bag! I decided to make a red sauce pasta dish to try to use up more of our pantry ingredients. I've had these cans of whole peeled tomatoes waiting for a rainy day, and though it didn't rain, they came in handy today. I made Mario Batali's Basic Tomato Sauce which reminds me of cappellini pomodoro, a dish frequently found at Italian-style restaurants. I added extra pepper to give my version a kick. We were going sans meat tonight so I figured the least I could do for hubby was make the dish spicy since he likes heat. Unfortunately, I noticed a crack in my spice jar. Guess it's time to make a trip to Crate + Barrel. I'll probably be frequenting the place anyways now that we'll have a full-sized kitchen to hold all the fun plates and mugs I've been dreaming of for the last couple years. We had a mache salad with cherry tomatoes and pine nuts and a balsamic-style dressing. I read online that mache has natural anti-stress properties. Please pass the mache! A little fresh grated parm on top. We had some Great Harvest Honey Whole Wheat toast with real butter on the side. A lil vino and water to go with dinner. Hubby picked up a treat for us while I was at work - cupcakes! He got two cupcakes in tiramisu and vanilla with chocolate icing, the latter being my personal fave. I managed to talk hubby into halving each cupcake so I could enjoy both flavors. They were both delish, but the vanilla with chocolate icing is still my favorite. Welcome to my life in boxes. I've spent a couple hours every day packing stuff up for the last week or so. Thanks to those efforts, we've already moved a lot of stuff into the house. Unfortunately, we still have a TON more to do! Where did all this STUFF come from!? I think it's time for another purge. Too bad we'll probably move in before we have the opportunity to figure out what's staying and going. On the positive side, progress is progress and we're off to a great start! What are your tips for moving/packing? On Tuesday, I picked up a beautiful kohlrabi at the local farmers market. I've never cooked kohlrabi, but I figured I'd be able to make something good out of it. The vendor who sold me the kohlrabi also gave me a couple recipes and when I saw a pasta dish, I knew pasta it was! Rather than following the recipe, I decided to wing it. I sauteed two organic chicken breasts (boneless), seasoned with salt and pepper. I cooked the kohlrabi in the same pot with the pasta. Onions, garlic, white wine (a pinot grigio I bought at Trader Joe's), and brown bits from the chicken helped make my sauce, along with pasta water. From the pasta pot to the saute pan. I think I misjudged how much pasta this small pan would hold. Oops! Some fresh-grated parmesan cheese on top makes pasta better. The finished product - light and delicious. Bring a large pot of water to a boil. Add kohlrabi and cook for 12 minutes. When chicken is done cooking, the kohlrabi 15 minutes should be nearly over. Add onions and saute till translucent, 3-4 minutes. When onions done, add garlic and cook till fragrant, about 1 minute. Add white wine to deglaze the pan. Bring to a boil and then lower to simmer to reduce liquid. Meanwhile, when the 12 minutes is over, add the linguine to kohlrabi and cook following package directions. Just before pasta is done cooking, slice chicken thinly. Serve pasta in low-bowls and top with freshly grated parmesan cheese. ...so I promptly cooked up a small bowl of oatmeal this AM to serve as a base for my raw chocolate nibs. I didn't really know what to expect from the Cacao Power. Would it be chewy? Soft? Sweet? They reminded me a lot of coffee beans in texture and slightly similar in taste, but with a more mocha-y flavor. I especially liked when the almost melted into my oatmeal and became ever-so-slightly tender. I thought they made for an awesome addition to my bowl of oats and hope to come up with some more creative concoctions. I've been feeling slightly blah yet inspired after my "down time" yesterday. To keep the positive vibes flowing, I decided to post some inspirational quotes in my cube at work. After a long day including 5 hours of conference calls, I decided to head over to our local farmers market. I ended up buying almost everything for the trip from the first table. This guy had so many lovely greens, I had a hard time deciding on what to buy. I almost got some of this beautiful bok choy. I did end up getting some of this fresh basil - some of the last of the season. I've got to get my basil while the getting's good! My goodies: spinach, kohlrabi, arugula (got this 1/4 bag for free from the vendor since he didn't have a full bag's worth to sell), basil, and a chocolate chip cookie to split with hubby. Ahh...I love going to this farmer's market. It's so nice to meet the people who grow and create the food I'm eating, plus it's nice to support our local farmers. I came home with my freshly picked veggies AND to a box at my front door with an Organic Food Bar label. Inside - the box of Raw Organic Food Bars in Chocolate Coconut I won on Twitter! I wanted to dig into one of these immediately, but I knew I needed to save room for dinner (and that cookie). I probably won't be able to resist tomorrow! I love these bars! I decided to use my freshly picked basil and spinach to make a spinach-quasi-pesto-shrimp dish. I didn't have most of the ingredients I needed to make a "true pesto" so I just used my basil, some organic garlic, some extra virgin olive oil, and cashews. Yup...I totally forgot to buy pine nuts at the grocery store, but I did have some cashews in the freezer, so I decided they'd do. If I had just had some hard parmesan cheese, I think I could call tonight's sauce "pesto", but instead, I'll call it "quasi pesto." Great Harvest Bread Company Honey Whole Wheat toast with real butter (Hubby picked this freshly baked loaf up today) - so fresh, so good! Hubby and I split the cookie for dessert, and I had some skim milk to go with my half. Check out Mr. Happy Face! Having a hard time lately with a goal or aspiration? Remember, when you feel defeated and like quitting, go harder than you went before! Never give up! I'm going to work on a post about dealing with "down times" and feeling defeated...hopefully the things that work for me will help you out, too! Need more inspiration? 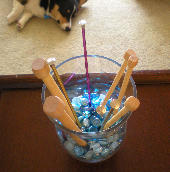 Dr Weil says playing outside will help you re-gain focus! Click for article. Hmm...maybe it's time I took a nature walk? After we got back from Charleston (and hubby watched the end of the Panthers game), we headed over to the house to try to tackle the wall paper in the dining room. Actually, firstly, we stopped at Lowes to pick up a steamer to help with the job...then, we headed to the house. Welcome to my beautiful dining room. Oh yea! ...I spotted my first roommate - a yucky spider. I really hope this house doesn't have too many bugs! If you've never taken down wallpaper before, then you have no idea just how time-consuming and slow-moving it is. We scraped and scraped and scraped. Upon further digging, we discovered there were THREE layers of wallpaper in our dining room. The blue-toned wall paper appears to be the original wall paper of the house. We think the trim, baseboards, and molding used to be a pretty baby blue. I kind of want to try to restore the original colors (sans wallpaper), but I really like the paint color I picked out, so I probably won't. I had my work/hiking boots on. These are my Timberlands from high school. For some reason, they were really popular back when I was in high school. Anywho, I put these on so hubby knew I meant business! After 4 hours, we called it quits so I could cook dinner and catch Drop Dead Diva and Cold Case. We got there 15 minutes too late to catch Drop Dead Diva, so we just paused the channel (thanks DVR) and recorded Cold Case (need to watch that this week sometime!). I thought about asking hubby if he just wanted to pick up pizza because after 4 hours of wallpaper removal, I honestly didn't feel like cooking, but I was glad I came home to prepare something. I used a single pot of water to cook both the organic udon noodles and organic broccoli. The sauce was simple with garlic and soy sauce. I thought dinner was pretty awesome. Hubby ate all the tofu and remarked that at least it didn't "make him ralph." Nice...lol. Hey, props to hubby for eating it! My sweet tooth was calling so I made another mini-parfait with Stonyfield Organic Oikos Greek Vanilla Yogurt with some Bear Naked Fruit + Nut Granola with a sprinkling of unsweetened coconut flakes, chia seeds, and a drizzle of honey. Yum! Does your SO eat tofu? Does he like it? Hate it? Ahh...back to real time posting! With the weather getting cooler, I crave nice, hot, cozy breakfasts like oatmeal more and more! I prefer to mix my oatmeal breakfasts with fruits and thought I didn't have any since hubby and I haven't been making it to the grocery store as much as we usually do. However, I found 3 beautiful SC apples in the fridge - I forgot I brought those back from my Farmer's Market trip with my parents this past weekend. I used the apples to make Apple Pie Oats. I had to go to work extra early today so I had time to stop by the post office to pick up a package. My Amazon.com box was here! I didn't get a chance to open the box before work, but I had a good idea what it was. I was hoping to work through lunch so I could leave early and swing by our house, but hubby called wanting to look at cabinets. Now, I don't know what kind of work environment you work in, but mine is very fast-paced and pretty high-stress and very demanding of my schedule. I rarely get to take lunch - sometimes because I'm too busy, but usually because I have phone conferences from 11am-2, 3, 4, or even 5 or 6pm. Anywho, I decided to take lunch to look at cabinets w/ hubby but would you know...we got to the cabinet shop and the place was closed with no signs for lunch! We even tried calling the shop's phone # and it was disconnected! Needless to say I was super irritated. I was irked by the waste of time and also by the fact that I wouldn't be able to make the zumba class I was hoping to go to after work since I ended up taking a lunch break instead of leaving "early". See, I've been working super hard on trying to choreograph some songs to show my zumba instructors, but none have come through till recently. I think I've finally choreographed something worthy of showing them to Shakira's Te Aviso, Te Anuncio (hot song!) and even emailed our head instructor about possibly showing her the dance after class. I was so excited to show her! And nervous. I did notice today that my leg seemed more tender than it was yesterday. I hear you'll feel a workout more 2 days after a workout than the very next day. Not sure if that's true. Anywho, either way, it was probably a good thing I didn't make class tonight. I am hoping to go tomorrow or Friday, though! I ended up staying late at work to make up for the time I missed at lunch and was soooo tired by the time I left. I was excited about opening my package, though. Inside - my new Canon EF 50mm f/1.8 II lens that hubby got me for my b-day! I can't believe I already have 4 lens for my DSLR, but hey...guess I have to start building my stash of lens if I'm going to get into freelance photography! A girl's gotta have options! As soon as I got home, I, of course, had to take out my new toy and play with some test photographs. The lens shot a lot like my macro lens. Actually, a little too much like it. I was hoping for something that would take more "regular" photos instead of already being so zoomed in with no option to capture more of a scene in your lens other than backing up. Oh well...I'll keep playing with it. I take such random photos when I play with new camera stuff. Here's the inside of my jacket. After playing a bit with my new lens, hubby and I headed to see our house. The wall in the between the kitchen and formal living room is COMPLETELY gone! I have to say, I think it looks pretty darn good in there without that wall! 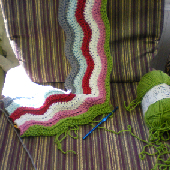 I can't wait to see how this project morphs and moves into its final form! I also took a moment to plant my Bay Laurel plant. That baby should provide me all the bay leaves I'll ever need for cooking! I hope the plant likes where I put it. After our quick trip to the house, hubby and I headed to Lowes to research cabinets. We're going to be adding lower cabinets under the new bar area separating our formal living room and kitchen, but we still need to buy them...yikes! I think we're running out of time. Anywho, we had a really friendly guy helping us and we picked out some we think we like, but I still think we should shop around a bit. I don't like accepting a first offer. Hubby decided it would be a good idea to hit up Olive Garden whilst looking over our cabinet catalogs. We got salad and breadsticks. We split the Cheese Fonduta appetizer. We also split Chicken Parmesan with Fettuccine Alfredo. I couldn't even finish my half-portion! When are more restaurants going to start offering more reasonable portions? As if we hadn't done enough today, we also went to the grocery store with fresh-cut coupons in hand to stock up on some essentials - plastic bags, laundry detergent, tooth paste...you know...the fun stuff. We saved $10 with all our coupons, though, so I was pretty happy about that! We gotta save every cent now that we're homeowners! We did pick up some Nestle Tollhouse Chocolate Chunk cookies. PS Leaving the cookies out while you pre-heat the oven = bad idea. They get all sticky and mushy and are much harder to work with. Oh, and the cookies...not so much for hubby and I. I'm still full from my 1/4 dinner, cheese app, and salad & breadsticks! The smell of fresh-baked chocolate chip cookies isn't doing anything for me right now, which is pretty weird. Perhaps I overate more than I thought? Anywho, these cookies are for the guys working on our house. I thought it would be nice to make them a little something and hubby thought so too. My mom has always brought treats to car repair shops, doctor offices, vet offices....anywhere she goes almost! People really like the treats and it's nice to do small gestures that brighten peoples days just a little. I hope to keep up my mom's random acts of kindness going forward. Hopefully the guys like their cookies tomorrow!